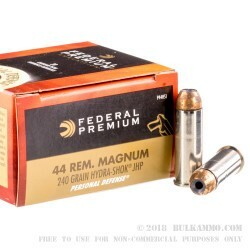 No compromises for the proven .44 Magnum; where others just go with enough: Federal Premium loads to the high end of the spectrum. The 240 grain Hydra Shok projectile is loaded for defensive purposes and is a shining example of the “no-compromises” concept that Federal Premium has used in manufacturing their top tier ammunition for decades. 1210 feet per second velocity and 780 ft. lbs. of energy with the proven hitting power and expansion of the Hydra Shok projectile, this is a force to be reckoned with in the defensive loads category. 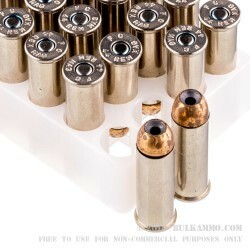 The penetration, knock down power and clean firing of this load make it a very good choice for those who carry or defend their homes with the .44 Magnum. 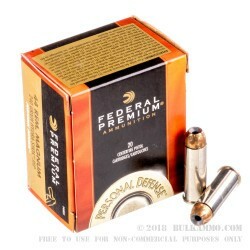 This round is also suitable for hunting big game with, and the high quality components and very consistent velocity range makes it an exceptionally accurate specimen within the .44 Magnum range of loads. 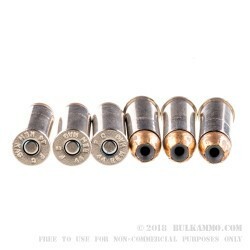 Nickel plated brass, boxer priming and clean powders for the .44 mag, make this a great candidate for the handloader that likes to fool around with new load concepts too. It is easily reloadable and offers you an easy cleaning task after the range.